Entries from Digital Intelligence tagged with "moneysupermarket"
Finance site MoneySupermarket.com has seen its search ads pulled from Google's search results due to a ‘lack of transparency’ over its payday loan adverts. 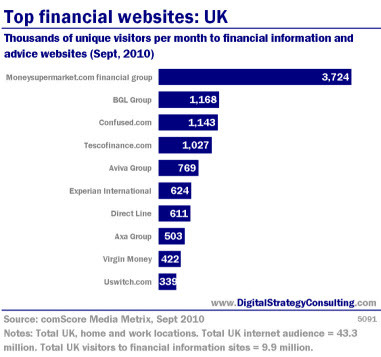 Price comparison service Moneysupermarket.com has acquired rival company Financial Services Net in a £9million deal. The Welsh company will pay an initial £4.6m, rising to up to £9m depending on performance, for the Coventry-based operator of Financialservices.co.uk. The company said the purchase would allow the firm to expand across the UK and beyond. Chief executive Peter Plumb told Business Post: “The acquisition of FSN will enable us to further expand our brand offering to new customer segments in the money and insurance business.” Financial Services Net (FSN) was controlled by the Panesar family and the purchase will incur expenses of about £600,000 for Moneysupermarket this year.